France’s version of the brownie. 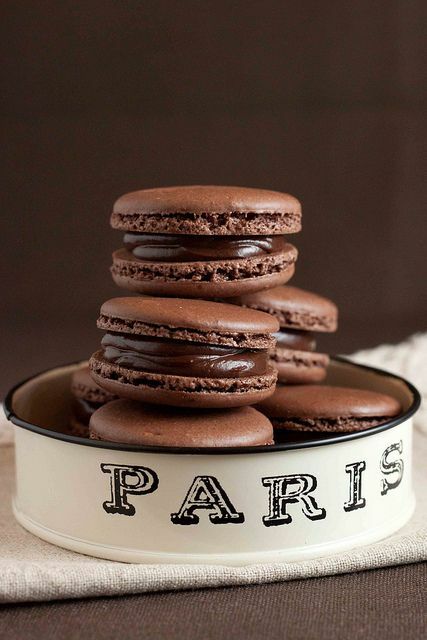 Pair macarons of similar size. Remove the ganache from the refrigerator. If you choose to pipe the ganache, transfer it to a resealable plastic bag and snip about a 1/2 inch off a bottom corner. Squeeze or scoop the ganache to about the size of a cherry (about 1 teaspoon) onto the center of a macaron half. Top with another half and press gently so that it looks like a mini hamburger. The filling should not ooze out the edges. Refrigerate, covered, at least 24 hours before serving. 0 Response to "French Chocolate Macarons with Chocolate Ganache"